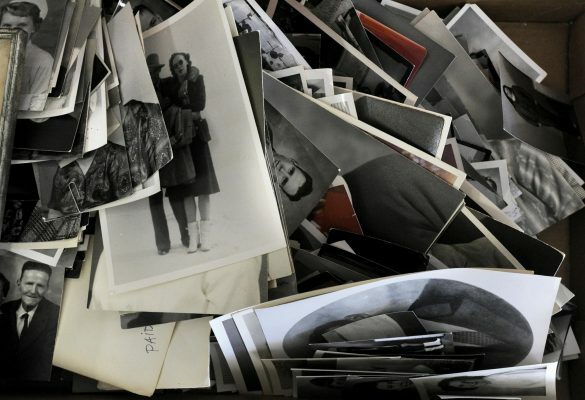 When I learned of the hundreds of negatives left by town photographer Tommie Rector and how one woman seemed to appear with more frequency than any other, it made me wonder. If a stranger only had a collection of my photographs, would they speak with the same whisper of loss that Rector’s had? This column was published Sept. 2, 2011. 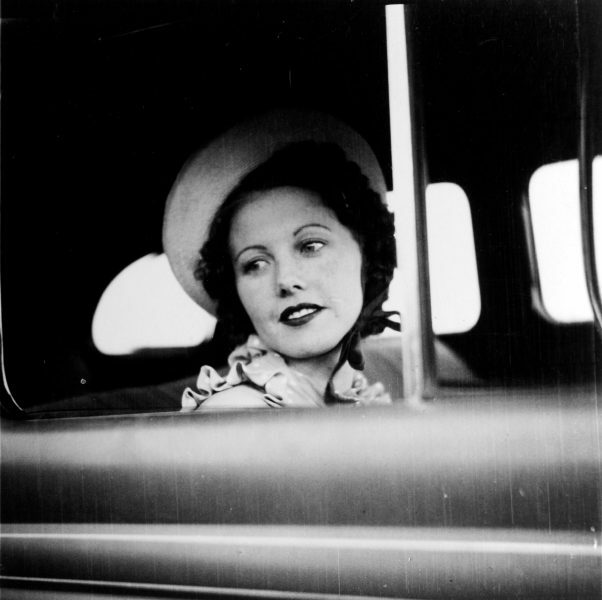 A picture of Dixie Millspaugh during the 1940s, made by Tommie Rector. STAMFORD — When photographer Tommie Rector donated the collection of his life’s work to the Cowboy Country Museum, it gave the town a window into its own history. But a closer look into the boxes of pictures also provides an insight into the man who made them. Rector died in December 2009, about a month before what would have been his 100th birthday. Three years earlier, he entrusted his collection to the care of museum curator Sandra Rhea — the two used to spend lunches together at the senior citizens center talking about the people and places captured by his lenses. One of many of the boxes of photographs donated by photographer Tommie Rector to the Stamford Cowboy Country Museum in 2007. Several boxes contain snapshots, many no bigger than a large postal stamp. In some, you can see mountains, or the Colosseum in Rome from Rector’s time in the Army. Others show friends around a campfire, or maybe him holding a fluffy cat. But throughout all of those small glimpses into his life, one person shows up again and again – a young woman named Dixie. “This was the love of Tommie’s life,” Rhea said. 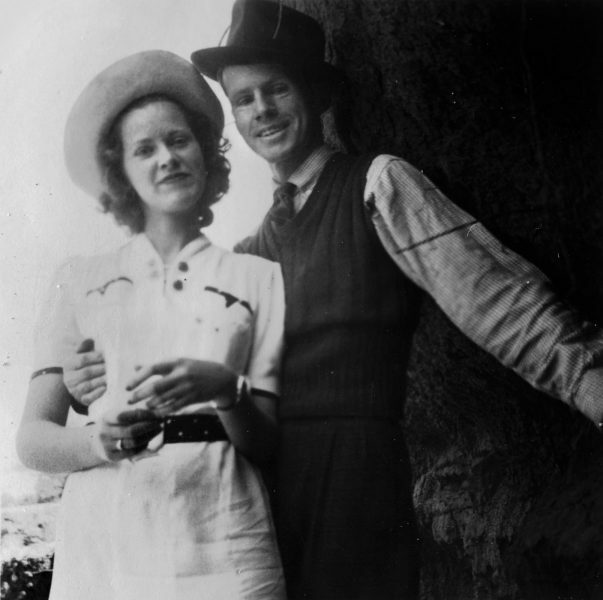 “No, they didn’t marry, but we found a lot of letters they wrote back and forth to each other,” she said. Rector inherited the photography business from his father, Ray. The elder Rector died by his own hand in 1933. A newspaper report in the museum said he left a note that declared he wasn’t afraid to leave the world. Tommie Rector left the business to go into the Army during World War II, but returned to Stamford afterward. During his military service, he continued to correspond with Dixie, filling his letters with the kind of poetry that Rhea said nobody in Stamford knew existed within him. “Every day I fall in love, all over again with you. I’ll never let our love grow old, I’ll always keep it new. 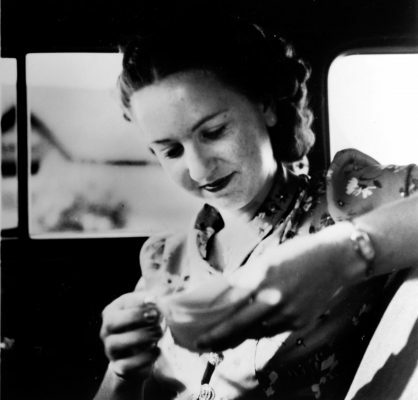 Dixie Millspaugh reads a slip of paper in the front seat of a car. The photographs depict a young woman with dark hair, occasionally smiling for the camera. Other times, she gazes out a car window, or Rector catches her in a simple activity like reading a small note, as if these moments are the ones in which she is most revealed , an essence of her he hopes to freeze. Rector eventually did marry at age 48, to a woman named Oradell. They never had any children, and his wife died many years before Rector. Oradell worked as a switchboard supervisor at the local phone company, and Rhea had vivid memories of her as a stern woman. “She always wore these high-heeled shoes, and when you were sitting at the switchboard she was walking up and down behind you all the time,” she recalled. Ironically, a quilt hanging in the entrance of the museum was made by Oradell. Rhea said the quilt was part of a fundraiser for the museum during when it was founded in the late 1970s. Why Rector married Oradell instead of Dixie has been a question puzzling Rhea since she started going through his pictures. One day at lunch, she posed her question to him. “I said, ‘Why in the world would you marry that woman?’ He said, ‘I don’t know,’” she recalled. When she asked him why he didn’t marry Dixie, he told her he didn’t want to talk about it. But when he did speak of her, Rhea said a little sadness came to her friend’s eyes, sometimes followed by a smile. One postcard to Dixie that Rector never got around to sending her from Italy has her full name on it: Dixie Millspaugh of Sacramento, Calif . An Internet search revealed that a Dixie Joan Millspaugh attended the University of California at Berkeley in the mid-1940s, but no other record of her could be found. “I think she was probably afraid to leave California, and he wanted to come back to Texas — that’s one thing I’ve thought about,” Rhea said. Is his a tragic story? “In places it could be,” she answered. After Rector died, Rhea wanted the windshield from his old car because he never removed his inspection stickers, perhaps preferring instead to think of them as decorations. Rector was a handsome man, and the combination of that and his profession produced quite a few pictures of pretty girls, though Rhea said they only found one of Oradell. Many appear to be friends, perhaps some were more, and Rhea asked him about those images. Tommie Rector and Dixie Millspaugh. “Yeah, but who’s in most of them?” he replied. “Yeah,” he said, and smiled.